It’s the 34th week of the year and the card of the week is the Three of Swords. There’s a lot of interesting things going on with numbers this week. Three aces appear in a row, suggesting that we will be blessed three times with the chance to start over again. The areas affected will be the of our lives involving personal power, abundance and clarity of mind. The aces represent the number one, so 1X3= 3. 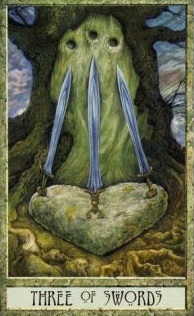 Three is another magic number of the week because the card that will govern the week is the 3 of Swords. This suggests that these new beginnings will help us overcome any kind of sorrow that has damaged our confidence, finances or mental health. Saturn stationed direct on Saturday after being retrograde since March. During Saturn Retrograde, we were called to confront difficult karmic lessons by the strict teacher, Saturn. The initiation is now finished and we realize that any heartbreak during this period was necessary to prepare us for the reward of the initiation. It’s the 34th week of the year and 3+4 = 7, a number of mystical experience. Ironically enough, 7 shows up three times this week as well – as the number of the week and twice as the card of the day, leaving us with the powerful 777, a number of good luck, blessings and the mystery of the eternal. Lastly, because 1 and 7 show up 3 times and the number of the week is 3, it reinforces that this is a powerful week to work on your karma because in witchcraft, all the good you do comes back to you threefold. Likewise, all the malice you put out comes back to you threefold as well. To make things even more interesting, we have a debatable solar eclipse on 8/18 that will bring energies that will further adjust karma. So this is a big week for setting things right. It’s a week to say I love you, to forgive and to ask for forgiveness. The choice is yours. Mantra: I love you, I’m sorry, please forgive me. 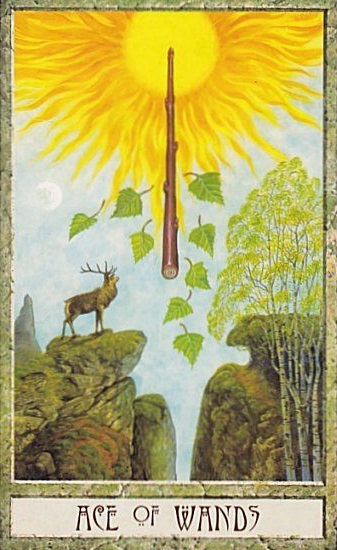 The card of the day is the Ace of Wands. When the Ace of Wands appears, it signals new beginnings and breakthroughs regarding your own personal power. Venus opposition Neptune at 10:04 AM PST brings deception and illusion in love and relationships. If confronted, be completely honest but don’t believe everything you hear. Moon sextile Neptune at 6:14 PM PST will bring a boost to your intuition. This transit has the potential to stimulate your imagination regarding issues in relationships and the tarot card of the day implies that you will see the potential that awaits you. Moon trine Venus at 7:07 PM PST will encourage you to pour love into whatever is important to you this evening and smooth out any bumps from earlier in the day. The Moon is in the sign of the teacher, Capricorn, so what comes to you today will serve as important lessons. The number of the day is 4, implying that what we face today will clear the way to create a more stable, satisfying future. Mantra: I am full of limitless potential. 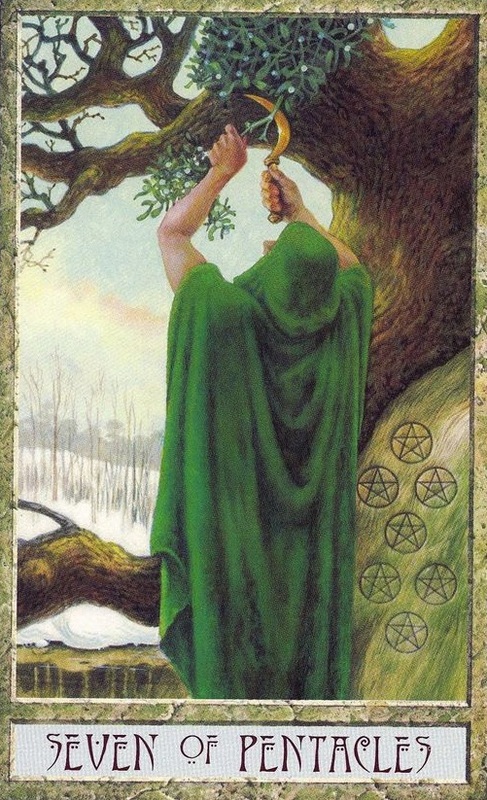 The Ace of Pentacles appears when we are presented with the opportunity to have the power to manifest new beginnings in money and abundance. Moon conjunct Pluto at 2:04 AM PST could open your heart to intense emotions. If this transit occurs while you’re asleep, it could bring you riveting dreams. Moon trine Mercury at 11:59 AM PST will find communication flowing freely. Moon square Uranus at 6:42 PM PST could bring a rebellious feeling that will make you want to push back against the established order of things in the name of change. Moon trine Jupiter at 7:45 PM PST will find you finishing of the the evening feeling optimistic. The Moon is in Capricorn until it goes void of course at 7:45 PM PST. The Lessons will continue to flow to us, this time they will most likely revolve around issues of security. Because the number of the day is 5, these lessons will show us how to overcome the challenges to our material stability and get back to a place of equilibrium. Mantra: Plant the seeds and see what grows. 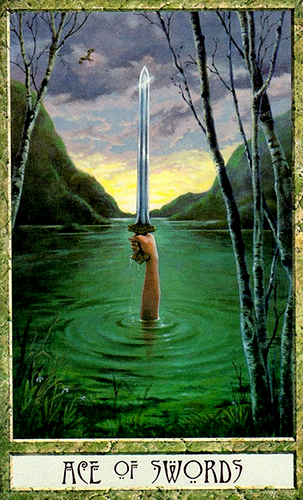 The Ace of Swords cuts through the mental fog and graces us with the clarity we need to see things for what they are. The Ace of Swords will most likely express itself with Sun trine Uranus at 1:23 PM PST will bring self discovery that leaders to positive changes. Moon sextile Mars at 3:50 PM PST will give you the courage, bravery and strength to accept the enlightenment that comes with taking up the sword. Since these breakthroughs could be particularly intense, Moon sextile Saturn at 10:21 PM PST will bring energy that will allow you to quiet your mind and reflect on the new beginnings that have been presented to you over the past few days. Take some time to meditate before bed and settle into the new beginnings on your doorstep. The Moon is in the revolutionary sign of Aquarius for most of the day, and since Aquarius is an air sign and the Ace of Swords is also ruled by the element of Air, the prospects for revolution are particularly strong. The number of the day is 6, a number reassuring you that any big changes undertaken now will work in your favor. Mantra: I cut away what doesn’t serve me and forge a new future for myself. 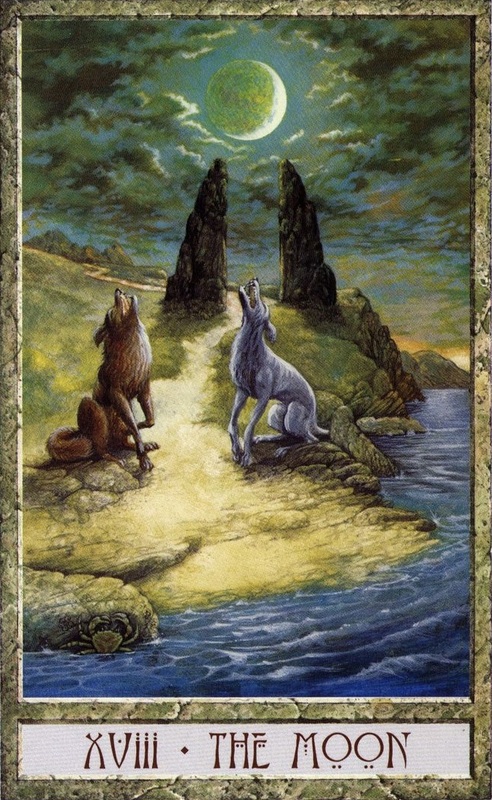 The Cancer ruled Moon is a card that appears when anxiety surfaces from the unconscious mind creates illusions. Venus trine Pluto at 7:15 AM PST will bring intense encounters in love and relationships. Any creative pursuits undertaken today will bare a profound intensity. Moon sextile Uranus at 11:50 PM PST will find you craving excitement. The Moon is still in the intense sign of Aquarius promising breakthroughs and earth shattering realizations. The number of the day is 7, and combined with the transits and the card, it will be a day that you may find yourself questioning who you are and the direction where you’re going. But if we fall back on the card for the day, we’re cautioned to not blow things out of proportion because the anxiety your experiencing is only surfacing due to the energies surrounding you and as the tides of the moon change, so does life. Most likely, the prenumbral eclipse tomorrow that’s stirring up old karmic issues. Mantra: What is full will become empty and what is empty will become full again. 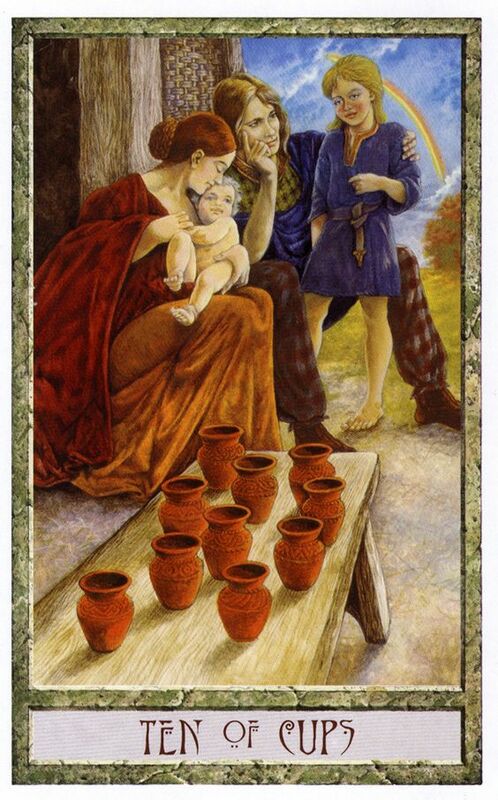 The 10 of Cups traditionally features a family dancing under 10 full cups spread across a rainbow above them. This is the card of happy endings. And the energy available to you is just that. Sources are debating on whether this is considered an eclipse or not. According to http://www.timeanddate.com, the earth, sun and moon will be within very close alignment but earth will fall short of being in the range to view the eclipse. Logically speaking, my personal opinion is that because the eclipse is going to be in Aquarius and we’ve dealt with so much revolutionary energy this week, issues that come up will be ones where the connection was missed — things that happened in the right place at the wrong place or the wrong place at the right time. But this there will be an almost prenumbral (partial) lunar eclipsed in Aquarius. This eclipse will highlight soul contracts that have been made and give you the opportunity to make things right with those who you have karma with and broken hearts will have the opportunity to be mended. Don’t let Moon square Mars at 9:53 PM PST rune the beautiful energy of the day with irritable energy. Instead, if you feel yourself feeling cranky, engage in physical activity to expend the pressure you’re feeling from the transit. The Moon is in Pisces for most of the waking hours of the day, encouraging you to go with the flow and get lost in your dreams. The number of the day is 8, a number of karma. Mantra: Everything was beautiful and nothing hurt. 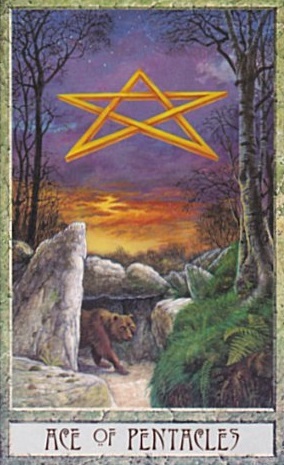 The 7 of Pentacles is a card of perseverance. You may have to work through some challenging issues but if you keep at it, you’ll overcome them. If you put the work in, you’ll be rewarded for it. Moon square Saturn at 2:19 AM PST could bring feelings of isolation and loneliness. If you’re asleep during this transit, these themes may appear in your dreams. Moon sextile Pluto at 11:33 AM PST will drag up deep feelings that could leave you obsessed with the past. Don’t see those things that ended as a death but as a rebirth. This feeling could continue with Moon opposition Venus. You may feel clingy and want to be close to people. It’s OK to seek comfort but don’t smoother people. The Moon is in the empathetic sign of Pisces so be there for others as you would like them to be there for you. The number of the day is 9, a number of endings becoming beginnings. Mantra: Stick with it, learn from it. 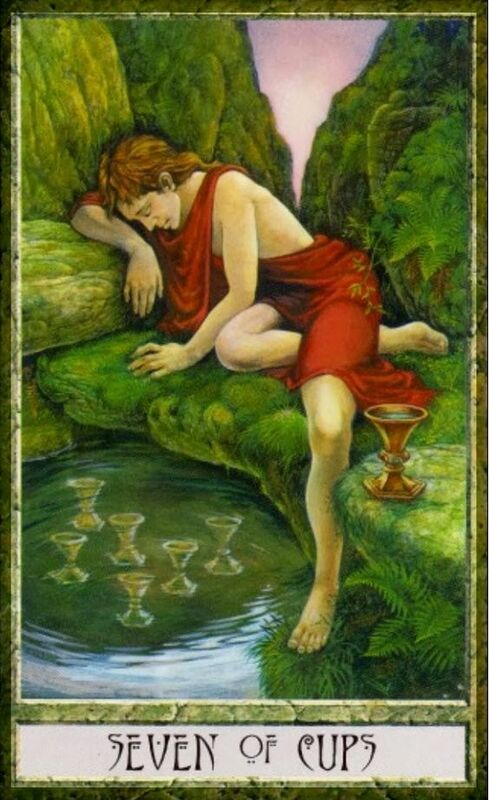 The 7 of Cups is a card that brings with it the opportunity to realize your deepest dreams. Moon opposition Mercury at 3:41 AM PST could put you at odds with yourself, possibly because you feel like your dreams are unattainable. If you’re asleep during this transit, the themes may appear in your dreams. Moon opposition Jupiter at 5:21 AM PST may find you ready to fight those fears when you wake up. It’s time to overcome the restless desire for freedom and take what’s yours. The Moon is void of course between 5:21 AM PST and 12:18 PM PST when it enters the fiery sign of Aries. When the Moon is in Aries, you’ll be able to tap into your willpower and push forward with confidence and determination. The number of the day is 1(0), a number of endings and beginnings. Mantra: The life I dream of is my reality. This entry was posted in art, Astrology, dreams, mysticism, mythology, numerology, occult, self help, spirituality, Tarot, Uncategorized, witchy, Writing and tagged abundance, art, astrology, card a day, divination, dreams, eclipse, empowerment, inspirational, magick, manifestation, mantra, meditation, metaphysical, motivational, mysticism, numerology, occult, pagan, predictions, psychic, self empowerment, self help, spiritual, spirituality, tarot, tarot reading, tarot weekly forecast, wicca, witchcraft, witchy, writing. Bookmark the permalink.